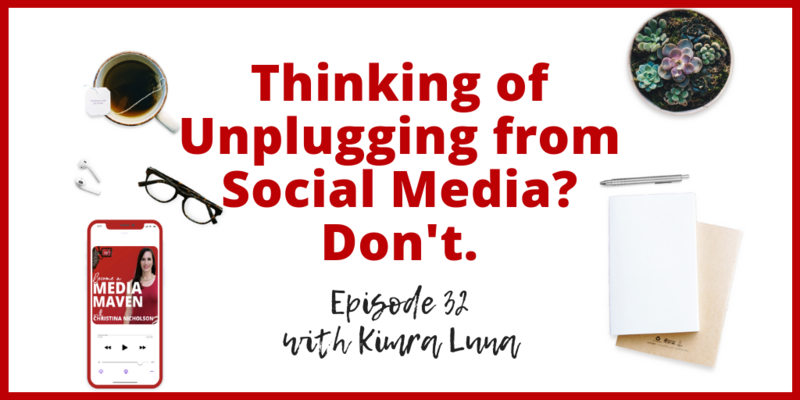 If you’re thinking of unplugging from social media, don’t. Here’s why. Kimra Luna has built a multimillion-dollar business online with no business skills. She’s also not afraid to post anything, and I mean anything on social media… and she doesn’t care what you think about it. That’s is why she’s successful. In this episode, Kimra is going to talk about how she got started as a mom blogger, then built real relationships with people online to grow a four million dollar business. She did all of this after being on welfare, while raising kids, and working on her own personal development. I love talking all about all these sorts of topics about being authentic online I think that’s why my business grew – because I’ve just been myself and, and even though some of the things I share are very hard, I think they’ve been important to share a great message for people. Then I started working with speech coaches and people like that who were like, “You know what? Your stories are powerful, Kimra. Like, your audience needs to, should hear these things and you’re really being a disservice if you are hiding these things and holding them in. So then I remember when I first shared that I had been on welfare as an adult and that I had been living at my inlaws with my two kids, and we were on welfare for about four years. I remember when I first shared that story and I sent out an email to my list talking about it. The feedback that I got – just so many people in the emails and were like – oh my gosh, thank you so much for sharing. I’ve always had so much shame around the fact that we’re still currently on welfare and we’re working on getting off of it, but it was relieving to me because I was terrified to send this email out. It’s not like I don’t get scared to share some personal things, but I was so terrified and I was so grateful and relieved when the emails came back from people showing their appreciation for me sharing. And ever since that day, it’s not that it’s gotten easier. Some things I’ve had to share were even harder – like sharing that I was separating from my husband was a really big deal because in the online space everyone saw me as super successful. She went from welfare to making seven figures and she has a super hot husband with a long flowy hair and the cute three boys and they live in this Manhattan high rise, and all this stuff… then to post online actually me and my husband are separating. It was the most terrifying post I ever made because I knew it crushed people’s dreams in a way. And it did. I got so many emails and messages from people saying they were sobbing and crying and I felt like everybody else was having a harder time with my divorce than I was even having, because like I just was like, “Hey, this is just part of my path and you know, we’re moving forward.” And everybody else was like sobbing and my team was sobbing. I mean it was like a really, really big thing and so it does take courage to post and I still do it even though I’m scared. Being scared doesn’t hold me back because I know it’s going to help people in some sort of way. I am on this journey and everyone is on it with me. I think sometimes we feel a little isolated cause we’re sitting behind our computer while we’re like writing a blog post or making a video for YouTube or whatever we’re doing. But we kind of forget that everybody who have opted in to our email list or is following on social, they’re on the journey with us. Like they’ve raised their hand and said, “Hey, I want to be on this journey with you. And I feel like when I’m sharing and the more vulnerable and raw I get, the more I relate to them just as people. It’s really just about connection and building relationships to me. I have a very big audience. There’s like 65,000 people on my list. There are hundreds, thousands following me on social media, but it’s almost like I feel like any person in my audience would feel completely comfortable coming up and giving me a hug rather than just a handshake. I think that’s the difference. To me, that’s important because I think humans need more of that connection. We’re so separated with our devices and sharing stories is one of the things that still brings us together. I mean, even when I do events in person, people don’t just shake my hand, they give me a hug. I think that’s the difference between people who are in the online space who are sharing real, vulnerable content versus people who are just sharing the sugarcoated version of everything.